Spray foam is the only thing to put in your crawl spaces, its a certified air and vapour barrier, The best way to insulate hard to reach areas, headers, crawl spaces, and great for new construction. Environmentally friendly insulation made from recycled plastics and soya. With one ecological insulation material you get the 3 essential properties for a high efficiency – building envelope in a single application. Consequently, you reduce the cost of the project as well as its energy consumption. High R-value (6) and ease of application. Seals out dust and pollen; generating energy efficiency that noticeably lowers bills. Uses renewable natural resources that expands to seal cracks, gaps and voids in walls and ceilings. Heatlok-Soya meets all the requirements of the National Building Code of Canada (NBC) and exceeds the quality Standard CAN/ULC S 705.1 “Standard for Thermal Insulation Spray Applied Rigid Polyurethane Foam Medium Density, Material Specification”. 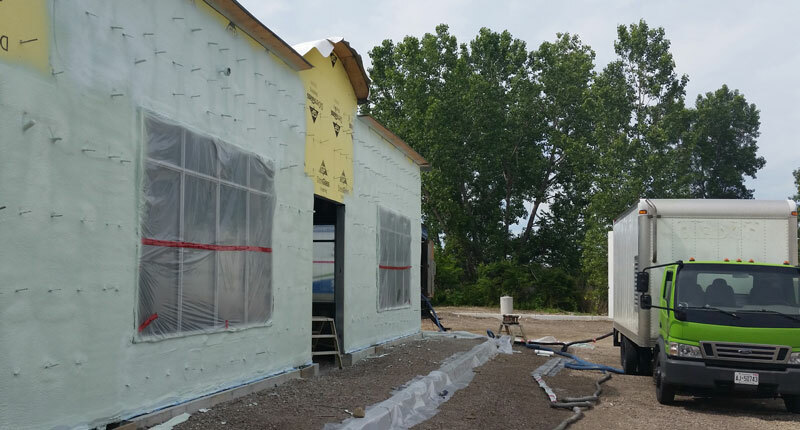 This new ecological spray foam insulation gives in a one step application a high long-term thermal resistance, an air-barrier material exceeding 500 times the NBC requirements as well as a vapor barrier. Approved by Canadian Construction Material Center CCMC #13244-L.
With one ecological insulation Polarfoam PF-7300-0 Soya you get the 3 essential properties for a high efficiency-building envelope in a single application. Consequently, you reduce the cost of the project as well as its energy consumption. Why is Eco Insulation® Spray Foam better than Conventional Fiber Insulation such as Fiberglass, Cellulose and Rockwool? Eco Insulation® Foam is spray applied in a liquid format and expands into a foam. It fills every single nook, cranny, crevice, hole, crack, and gap making a perfect continuous air-tight seal every time, regardless of complex framing and penetrations. Eco Insulation® Spray Foam has a “Real World” R-Value that is un compromised by external forces like temperature and wind. Fiber Insulations such as Fiberglass, Cellulose, and Rockwool merely slow down convection which accounts for 80% of heat loss. As the temperature drops, convection currents speed up and Fiber Insulations loose their effectiveness at slowing them down. Eco Insulation® Spray Foam on the other hand stops that convection. Wind is not a factor either for Eco Insulation® Spray Foam due to its continuous air-tight seal. Eco Insulation® Spray Foam adds structural strength to a building. It’s rigid structure increases shear and racking strength by 300%. Eco Insulation® Spray Foam is its own building code approved Thermal Insulation, Air Barrier, and Vapour Barrier. It’s closed cell structure stops convection currents, which eliminates condensation, moisture, and mold. Eco Insulation® Spray Foam improves indoor air quality and living comfort. It creates a continuous air-tight seal, dust and other exterior pollutants cannot enter the building. It is also significantly reduces noise, a building sprayed with Eco Insulation® will always be quieter than using Conventional Fiber Insulations. Eco Insulation® Spray Foam is environmentally friendly. Eco Insulation® Spray Foam is made from annually renewable Soybean oil and recycled plastic bottles. Eco Insulation® Spray Foam has the highest R-Value. R-Value is a measurement of thermal resistance. A higher R-Value means a greater ability to resist heat flow. Eco Insulation® Foam has the highest R-Value (7 per inch) of any insulation product available today.